The festival of Holi saw elaborate and enthusiastic celebrations all across the nation. But the playing of colours is not done yet, as today, March 25, marks the festival of Rang Panchami. Rang Panchami wishes and messages are exchanged with everyone on this day. Rang Panchami or Ranga Panchami is the last day of the festival of colours. It is celebrated 5 days after the celebrations of Holi. The word Panchami means the fifth day. Rang Panchami is observed during the waning moon phase of the Hindu month of Phalgun. Just like Holi, the festival of Ranga Panchami also sees playing with and colours. 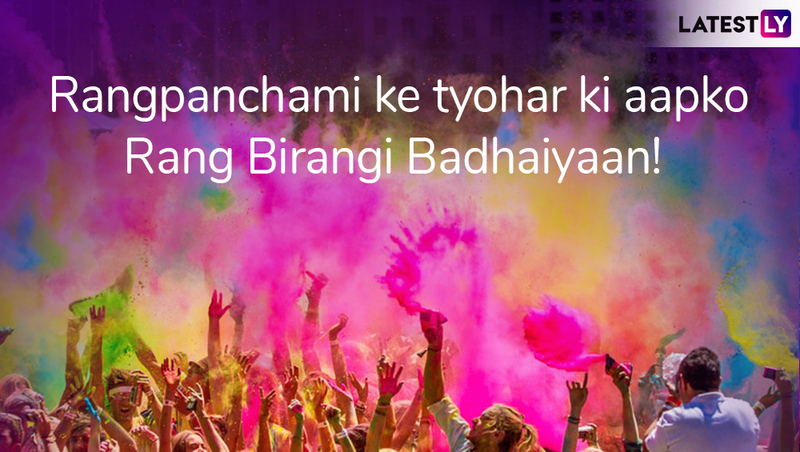 Just as people send Happy Holi messages and images, Rang Panchami greetings are also exchanged with friends and family. 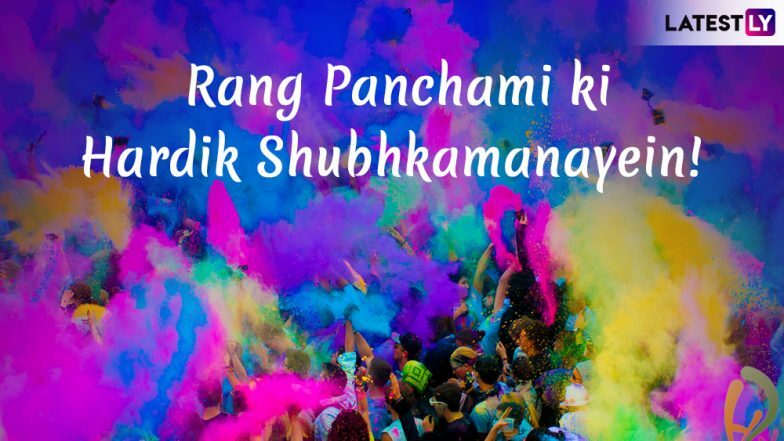 If you have been looking for Rang Panchami messages, WhatsApp stickers, Facebook images and greetings, let us give you a collection of Rang Panchami 2019 wishes. Rang Panchami 2019 Significance: Why This Day Is Celebrated? Know History of the Last Day of Holi. 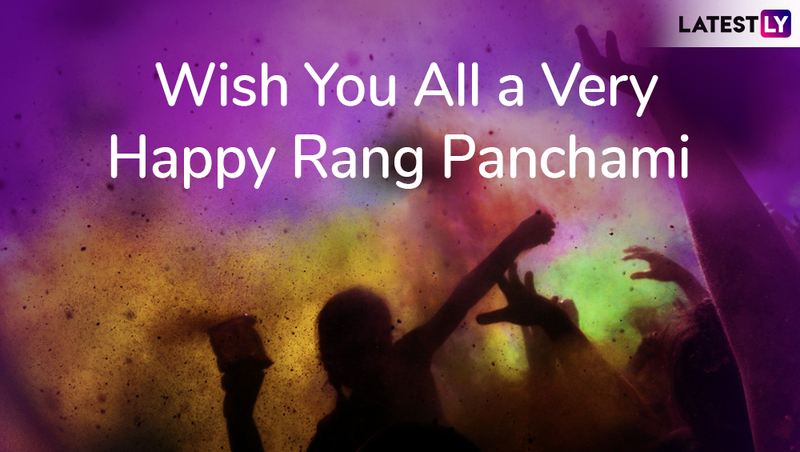 The word 'Rang' means 'color' and 'Panchami' refers to the fifth day. So several parts in the country celebrate Holi on the day of Rang Panchami. The festival of Rang Panchami is more popularly marked in the states of Maharashtra, Madhya Pradesh and some parts of North India. People play with colours and water with their friends and family. They also observe and pray to Lord Krishna and Goddess Radha on this day. Holi 2019 Jokes and Funny Memes: Send These Hilarious Images & WhatsApp Stickers to Spread Some Laughter During Festival of Colour. Message reads: Wish you all a Very Happy Rang Panchami! Message reads: Rang Panchami ke tyohar ki aapko Rang Birangi Badhaiyaan! Message reads: Rang Panchami ki Hardik Shubhkamanayein! Message reads: Vasant rutu ki bahar, chali pichkari uda hai gulal, rang barse nile, hare, laal, Mubarak ho aapko rang panchami ka tyohar! Message reads: Ye rangon ka tyohar aya hai, saath apne khushiyaan laaya hai, humse pehle koi rang na de aapko, isliye humne shubhkamnayon ka rang sabse pehle bheja hai. WhatsApp stickers make it easy to send any greetings and wishes on just one click. If you do not prefer sending images and greetings you can send your wishes through WhatsApp stickers instead. You can download Rang Panchami WhatsApp sticker packs and then send in your greetings through the app. We hope the above messages, greetings and images help you to send Happy Rang Panchami 2019 wishes to your friends and family. You can send these images, messages or even WhatsApp stickers and send heartfelt wishes for the festival of colours. Wish you all a very happy Rang Panchami 2019!